Gilles Deleuze and Félix Guattari’s Anti-Oedipus surely has some of the most remarkable opening lines of any work of philosophy or cultural critique. First published in France in 1972, just a few years after the demonstrations of May 1968, its stylish bravado immediately reminds us of the attitudes struck by student agitators, and proclaims that their radical energies persist: “It is at work everywhere, functioning smoothly at times, as other times in fits and starts. It breathes, it heats, it eats. It shits and fucks. What a mistake to have ever said the id.” The original French is even more striking, playing on the fact that “id” and “it” are both “ça” (“Ça fonctionne partout . . . Quelle erreur d’avoir dit le ça.”). “It” is a machinic unconscious that is defined not by what it represents, but by what it produces: “Everywhere it is machines–real ones, not figurative ones: machines driving other machines, machines being driven by other machines, with all the necessary couplings and connections” (Anti-Oedipus 1). The question “what does it mean?” gives way to “how does it work?” As Deleuze and Guattari go on to declare in their second enquiry into “Capitalism and Schizophrenia,” A Thousand Plateaus: “We will never ask what a book means, as signified or signifier: we will not look for anything to understand in it. We will ask what it functions with, in connection with what other things it does or does not transmit intensities, in which other multiplicities its own are inserted and metamorphosed” (A Thousand Plateaus 4). They therefore refuse any attempt to derive meaning from biography, to reduce the work to its author(s). Indeed, they disclaim authorship as anything but a matter of arbitrary convenience and custom: “Why have we kept our own names? Out of habit, purely out of habit. To make ourselves unrecognizable in turn. [. . .] We are no longer ourselves. Each will know his own. We have been aided, inspired, multiplied” (A Thousand Plateaus 3-4). Deleuze and Guattari’s skepticism about interpretation and authorship does not, however, mean that any attempt to write their biography is doomed. In the first place, there is no reason why a biographer should accept his or her subjects’ own strictures. There is no need for a Life of Marx to be Marxist, for instance. Otherwise, all biographies would be hagiographies, explications written solely by disciples and camp-followers. They would be third-party autobiographies, attempts to outline a subject’s own ideal self-understanding without taking the distance necessary for critique or contextualization. And surely Deleuze and Guattari’s denial of meaning or authorial presence should put any analyst on the alert: what are they trying to hide? Indeed ultimately Dosse, rather conventionally, concludes that their work is best explained “as a displaced effect of the shattering consequences of the values and triumph of Nazism” (520). It is shaped by the fact that each just missed World War II and experienced its trauma only “tangentially and after the fact” (Deleuze’s older brother joined the Resistance and was caught and killed en route to a Concentration Camp), but that both men found compensation in May ’68, in which they “participated fully.” “Particularly sensitive to the issues of their period,” Dosse claims, “they immediately understood that these events were creating a rupture and starting something new” (521). But precisely the bathos of this conclusion makes us wish for a rather more radical approach to biography. For even if one were to accept fully their arguments against biographical interpretation, one could still quite easily imagine a Deleuzoguattarian account of the machinic processes, the connections and multiplicities and intensities, that the proper names merely cloak. If “Deleuze and Guattari” is better seen as an assemblage or “arrangement” rather than simply the conjunction of two individuals, the makings of that arrangement–both its constituent elements and its product–can still be mapped and followed, albeit schizoanalytically rather than psychoanalytically. These two profoundly different men–Deleuze the stay-at-home philosopher, Guattari the ever-restless activist with a writer’s block–entered into a dance of mutual seduction and becoming not unlike that traced by orchid and wasp in their own analysis. Guattari unsettled Deleuze, firing him up and reframing his philosophy in newly political terms; and Deleuze made Guattari sit down at his desk every morning, and then “mail his daily draft” (7). Yet for all the intensity of their relationship, over almost three decades, they never stopped using the formal vous with each other. The problem with Dosse’s book is that far too often it feels as though there is simply no particular strategy at work. It opens with a somewhat stunted attempt at conventional biography, which breaks off almost as soon as each of its subjects leaves home, after which we hear very little of parents or brothers, wives or children. Indeed, it is something of a shock when these familial figures re-appear around the deathbed or at the funeral. Guattari’s elder brother, for instance, is pictured “surprised and disturbed by the enumeration of [Félix’s] various feminine conquests in front of his brother’s tomb” (494), but we might be equally surprised to be reminded that Guattari had a brother at all. And yet the book features a couple of intriguing photographs of the Guattari clan–one showing the three brothers with their trousers rolled up as though coming from the beach, yet two are dressed in jackets and one even wears a tie plus a neatly folded handkerchief in his top pocket. But nothing is said of this. Likewise, there are a couple of truly extraordinary images of Deleuze with his brother, Georges: one in which they are both in some kind of costume, Gilles a toddler with a top hat and polka dot jacket; and the other in which they are wearing tennis gear, Gilles turning his head towards his sibling. In both instances, the older brother lays his hand, gently and protectively, on the younger boy’s shoulder. But having briefly noted the significance of Georges’s wartime death, Dosse never returns to the subject. More consistently, the book tends towards offering a portrait of an intellectual milieu, not unlike Elisabeth Roudinesco’s magnificent collective biography of French psychoanalysis, Jacques Lacan and Co. In that Deleuze and Guattari came into contact with just about every major figure of post-war French philosophy and psychiatry, as well as many other major cultural and intellectual figures–Deleuze was a high-school friend of the novelist Michel Tournier and Guattari collaborated with playwrights, painters, and film directors–we are often confronted with long lists of names, some more familiar to Anglo-American readers than others. The “intersecting lives” outlined here belong also to Jean Hyppolite, Louis Althusser, Jean Oury, R. D. Laing, Michel Foucault, Toni Negri, Jean-François Lyotard, Alain Badiou, Eric Alliez, and on and on. Yet Dosse remains too focused on his two principal actors to make this successful as an institutional biography. The secondary characters only have the spotlight so long as they interact in some way with Deleuze and Guattari, and what happens when they are on their own is ultimately of as little interest as Rosencrantz and Guildenstern’s adventures are to Shakespeare’s Hamlet. As a result, for instance, we get here a strangely partial view of Badiou, who features only as a putative rival to Deleuze at Vincennes, leading Maoist hit-squads to interrupt his colleague’s seminars, and later (allegedly) traducing his work in Deleuze: The Clamor of Being. Meanwhile, key absences make this very incomplete as a history of post-war philosophy after structuralism. Most notably, perhaps, of Jacques Derrida there is barely a trace. Dosse observes that multiplicity, connection, and heterogeneity are basic features of both Deleuze and Guattari’s worldview and their literary and philosophical style. Their work is astonishingly eclectic and wide-ranging, touching on Anthropology, History, Politics, Biology, Geology, Mathematics, and so on. It may be in homage to this proliferation that Dosse, too, amasses information from his exhaustive research, wide reading, and many interviews of everyone from Deleuze’s wife Fanny or Guattari’s son Bruno to students, friends, collaborators, and critics. But overwhelmingly the logic structuring this concatenation of material is less the “creative stammering” of “and . . . and . . . and“ that Dosse quotes from Deleuze in his book’s penultimate paragraph (523), and more the banal contiguity of “also” that suggests proximity without any real relation. “Also” is Gosse’s conjunction of choice, appearing every other page or so. To take one series almost at random: “Deleuze and Foucault also admitted” (316); “What was also playing out” (317); “and also strongly influenced” (318); “Foucault also drew on Stoic arguments” (319); “they were also very different” (320); “narratives that were also manuals” (321); and so on and so forth. Or frequently there are simply no conjunctions at all. Non sequitur piles up on non sequitur. Chronology is abandoned; to take but one example, the chapter entitled “The Year of Combat: 1977” in fact takes us in one page from 1997 to 1970 to 1995 to “the 1970s” to “the late 1980s” (367). The overall effect is often extremely bitty and disconnected. Quotations (a sentence or more long) are rarely introduced or contextualized, and it is only by recourse to the endnotes that a reader has any idea who is saying what when. This may perhaps sound suitably Deleuzoguattarian in its erasure of individuality or its bricolage of elements from diverse sources, but in practice it sacrifices any sense of texture, any feeling of differentiation or difference as information and opinion simply agglomerate, one damn thing after another. Accounts of texts by either Deleuze and Guattari or both are built up by collecting piecemeal other people’s précis or other people’s evaluations. The effect is often confusing and rarely illuminating: this is seldom a biography from which you feel you have gleaned a better understanding of Deleuze and Guattari’s work than you would by simply reading it yourself. All of which prompts the question as to the purpose of this biography. If the life does not illuminate the work, and if the life is of no particular intrinsic interest itself (as is especially the case of Deleuze, who seems mostly to have read, written, and taught, and to have occasionally tagged along to events with his buddy Guattari), then why bother? Dosse suggests that one of his aims is to underline Guattari’s contribution to the collaboration, but a slim article rather than a bloated book could have achieved the same end. Especially compared to the brio and bravado of Deleuze and Guattari’s own work, which gets to the point so quickly and so memorably (“What a mistake to have ever said the id. Everywhere it is machines . . .”), it is a shame that their biography proceeds with so little drive or desire. 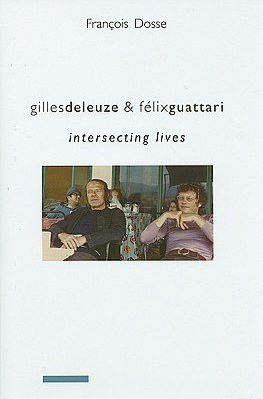 Deleuze, Gilles, and Félix Guattari. Anti-Oedipus: Capitalism and Schizophrenia. Trans. Robert Hurley, Mark Seem, and Helen Lane. London: Athlone, 1984. —–. A Thousand Plateaus: Capitalism and Schizophrenia. Trans. Brian Massumi. London: Athlone, 1988. Jon Beasley-Murray teaches at the University of British Columbia, where he is an Assosciate Professor in Hispanic Studies, specializing in Latin American studies and in social and political theory. He is the author of Post-Hegemony (University of Minnesota Press 2011).